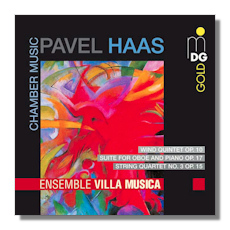 Born in Brno in 1899, Pavel Haas belongs to a generation of Czech composers who were born near the end of the 19th century and reached musical ripeness in the late Romantic tradition but had to pursue their own artistic identity in the cauldron of modern 20th century music. The aspects of Haas' oeuvre who also studied with Leo Janáček (1920-22) are mainly those of seeking a source of innovation in Moravian folk-song and dance, drawing upon synagogal singing and Gregorian chant; general acceptance to modern trends and loyalty to Janáček's maxim that "a modern composer has to write what he has truly experienced". Indeed all of his works are permeated by an indomitable spirit that helped him face huge sufferings all throughout his life, finally culminating in his being murdered at Auschwitz in 1944. The 1930 Wind Quintet alternates between blissful and serious moods but with its rhythmic 3rd and chorale-like 4th movements, the piece has a strong element of hope. The 1937/8 Third String Quartet has very few quiet moments, indeed its aggressive march-like tone seems to anticipate Hitler's invasion of the Sudeten region. The Suite, Op. 17 is the most personal piece of the three on this disc. Written in 1939, it is a defiant work and gathers all the "angst"that Haas was going through at his unsuccessful attempts to flee the Nazi terror. The members of Villa Musica are always passionate advocates for the works they perform, but this disc is much more than that. It is a testament and a tribute to the undying spirit of art in the face of adversity. It is this spirit that this Ensemble manages so brilliantly to pass on to the listener. As usual with MD&G, sound and presentation are top drawer quality.